Sorry for not posting sooner. I have actually tried to post a few times but for some reason my computer wouldn't let me upload any pictures. Anyway, we have been busy since our trip to Ohio. Ainsley met a new friend in May - Garrick Pittman, Richard and Caroline's son. Doesn't he have the cutest smile?! 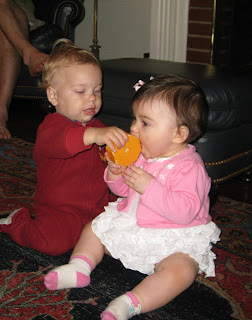 They had fun playing together at his grandparents' house (John and Katheryn) when they came to Greenwood for a visit. We hope they come back soon! Ainsley and I on Mother's Day with my Mother's Day bouquet.